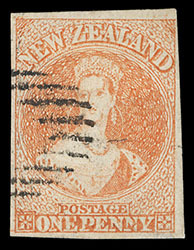 New Zealand, 1858, Queen Victoria "Chalon Head", 1d dull orange on thick soft paper, imperf, unwatermarked, o.g., hinge remnant, full to large margins except close at bottom left, deep vibrant color on thick soft paper, inclusion speck and couple thin spots, Very Fine appearance. Scott No. 7. Campbell Paterson No. A1d (1). SG No. 8 £3,750 ($4,930). New Zealand, 1858, Queen Victoria "Chalon Head", 1d dull orange, imperf., Re-entry variety (R. 14/12), unwatermarked, barred oval cancel, full to large margins except clear at upper right, strong bright color, fresh and Very Fine re-entry variety. Scott No. 7 var. Campbell Paterson No. A1d (Z). SG No. 8 var. £750 as normal ($980). New Zealand, 1858, Queen Victoria "Chalon Head", 1d dull orange on thick soft paper, imperf, unwatermarked, full to huge margins, pretty pastel color, neat strike of numeral barred oval, Very Fine. Scott No. 7. Campbell Paterson No. A1d (1). SG No. 8 £750 ($980). 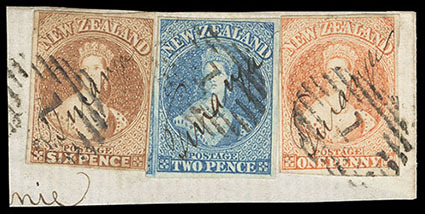 New Zealand, 1858, Queen Victoria "Chalon Head", 1d dull orange, imperf, unwatermarked, clear to large margins, used with 2d blue (10), huge margins, and 6d bister brown (12), full to large margins, each cancelled by manuscript "Turanga" postmark and tied by numeral "1" barred ovals of Auckland on small piece, likely prepaying the 9d rate for a ¼ oz. 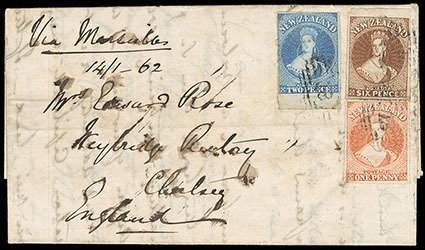 letter to the United Kingdom via Marseilles, Very Fine and rare manuscript Turanga cancelled piece. Scott No. 7. Campbell Paterson No. A1d. SG No. 8 Estimate $1,000 - 1,500. The missionary postmaster, Reverand Grace, used the Maori name Turanga instead of Grisborne during the period 1855-1869. 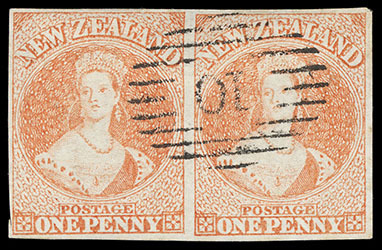 New Zealand, 1858, Queen Victoria "Chalon Head", 1d dull orange, imperf, unwatermarked, vertical pair, each stamp canceled with numeral "15" barred ovals of Nelson, large margins all around, bright vibrant color, particularly fresh and Extremely Fine. Scott No. 7. Campbell Paterson No. A1d. SG No. 8 £1,500 as singles ($1,970). A GEM AND EXCEEDINGLY RARE VERTICAL PAIR OF THE 1858 1D RICHARDSON PRINTING ON WHITE PAPER. 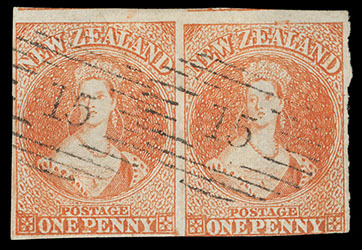 New Zealand, 1858, Queen Victoria "Chalon Head", 1d dull orange on thin hard paper, imperf, unwatermarked, horizontal pair, large margins all around, tiny scissor cut in left bottom margin only, bright color and paper, sharp numeral "10" barred oval, fresh and choice Very Fine, Yeroc, J.M.A. Gregson, January 2000, lot 73. Scott No. 7. Campbell Paterson No. A1d (2). New Zealand, 1858, Queen Victoria "Chalon Head", 1d dull orange, imperf, Re-entry (R. 18/5-6), unwatermarked, clear to huge margins including part of adjacent stamps at top, just touched at bottom right, bright color and paper, each cancelled by sharp numeral "15" barred oval of Nelson, fresh and Very Fine re-entry pair, Mann, Harmer Rooke & Co. Scott No. 7 var. Campbell Paterson No. A1d (Z). SG No. 8 var. £1,500 as normal singles ($1,970). A faulty impression (extrinsic re-entry) covering both positions with parts of the faulty left frame line 5.3mm from the right corner of No. 5 and faulty right frame line 6.5mm to the left of the right edge of No. 6. In No. 6, a curved line, corresponding to a portion of the heavily engraved base line of ZEALAND, cuts the W of NEW. Spots of color are found in the letters ONE PEN. 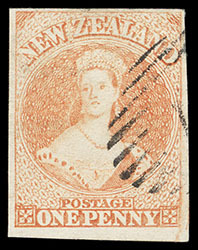 New Zealand, 1858, Queen Victoria "Chalon Head", 1d dull orange, imperf, unwatermarked, horizontal strip of four, large margins except barely in at left, bright color, each cancelled by numeral "15" barred oval of Nelson, faults including thinning and vertical crease in second, Very Fine appearance. Scott No. 7. Campbell Paterson No. A1d. SG No. 8 £3,000 as singles ($3,940). THE LARGEST KNOWN MULTIPLE OF THE 1858 1D RICHARDSON PRINTING ON WHITE PAPER. 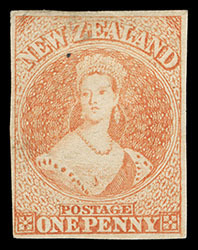 New Zealand, 1858, Queen Victoria "Chalon Head", 1d dull orange, imperf, unwatermarked, huge margins to touched, lightly tied by indistinct numeral "18" barred oval, matching light "Otago, New-Zealand, OC 15, 1860" origin backstamp on local gray drop cover to Port Chalmers; some cover faults, Fine and rare local "drop letter" rate cover bearing the 1d dull orange, Greg Francis, Spink, July 2014, lot 1426. Scott No. 7. Campbell Paterson No. A1d. SG No. 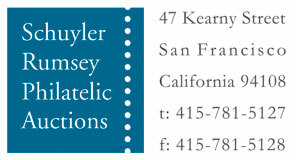 8 Estimate $750 - 1,000. John Woolfe, Spink, October 2006, lot 253. Scott No. 7. Campbell Paterson No. A1d. SG No. 8 Estimate $2,000 - 3,000. AN ATTRACTIVE THREE-COLOR FRANKING PREPAYING THE 9D RATE TO THE UNITED KINGDOM VIA SUEZ AND MARSEILLES. This cover contradicts the suggestion by Kirk and other authors that the Marseilles mail arrived in that port on April 16th by the P&O "Sultan". As this ship was late arriving at Alexandria, contemporary newspapers show all mail was put on board the "Mooltan" to be trans-shipped at Malta to the Royal Navy vessel HMS "Icarus". This cover is correctly prepaid 9d for a ¼ oz. 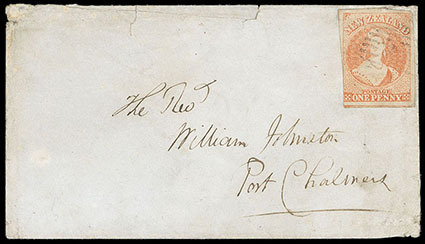 letter to the United Kingdom via Marseilles, which is a premium of 3d per ¼ ounce over the standard rate via Suez and Southampton.